No matter how good your product or service, not every review will be positive. We take a look at how to respond to negative reviews – and how not to. Businesses have always relied on their reputation to promote and bolster their offerings. The history of trademark law stems directly from the need for businesses to assert and protect their reputation. In the modern day, the opportunities to delve into the history of public interactions with a business has grown. Today, between a third and half of customers use online research and reviews when making a decision. 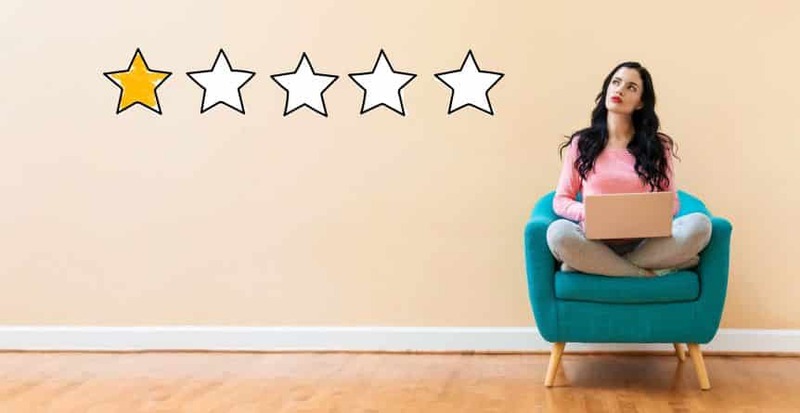 Reviews provide a vital tool for both businesses and consumers. This functionality isn't limited to reputation but includes a feedback loop to see how a business reacts to challenge. We've covered more aspects of why reviews are important. to keep the feedback loop functional for your business, you need to know how to respond to negative reviews. This guide will explain the essential ways to, and not to, react to reviews. Keep the following guidelines in mind to leverage a negative review for your benefit. People fill in blanks with negative assumptions. A negative review left unanswered drives consumers to imagine that everything said is true and worse. They also take silence as a tactic acknowledgment of the faults. Finally, a lack of response indicates a lack of concern. A company that doesn't protect its reputation doesn't care to guarantee products and services. Prompt responses show that you care about your social media and engage with your customers. It reflects that you know how to manage and promote your image online. A company that doesn't curate its online presence gets accused of following trends. There are three types of negative reviews but all require the same pattern in response. Primarily, customers leave a negative review when they have a problem with your offerings. Secondly, they leave reviews when they get upset or when they seek attention. The first one needs addressing to ensure you fix the problem and ensure consistency to current and potential customers alike. The second group acts emotionally without a specific goal in mind. Addressing the issue forces them to focus their often vague complaints into something that you can address clearly. How you chose to announce a solution to the problem varies by offering but acknowledging that someone has an issue does the bulk of the work. People get defensive when they feel backed into a corner or made to reveal details they don't want to. Make a contact statement on their initial negative review and then a resolution statement. The middle portion of the argument is best had in a place where outside voices don't interfere or inflame. Most review sites give you the ability to contact responders through email or a mediation system. Blind email systems, in which the site mails both groups, help in these instances. Use these to keep the details and personal information out of the public eye. Once you reach a resolution, get approval of your final public statement from the customer. This both keeps the comment section from getting ugly and empowers the customer that they have a part of the final say. Avoid using press-releases and boilerplate when addressing a concern. The customer doesn't want a canned answer or to feel like they are talking to a program. Real human interaction solves far more disputes in the first response. Still, remain professional. You represent the company and want to be their buddy as a substitute for being helpful. Negative reviews cause damage to businesses with stats showing nearly 45% of consumers making a ‘no' decision based on reviews. To avoid making a touchy situation worse, don't do these things. Even when the complaint seems tangential to your business, you need to address the issue as presented and act as if you both can and will fix the issue. Getting angry and responding in a heated manner will escalate the situation and trash your professional image. Put yourself in the reviewer's mindset and consider how you would like to be addressed. Never match their tone or take it to their level. You always want to remain professional and open to communication. If a situation is out of control, rely on the sites posting policy as a guide when removing a review. Do not suggest that the customer remove the review or write a positive one. What they chose to do after an interaction is up to them. Avoiding the appearance of impropriety maintains professionalism. It also keeps the interaction about addressing the issue, not saving face. You protect the image of the company by resolving the topic of a negative review, not sweeping it under the rug of other positive reviews. Negative reviews easily come across as hostile and potentially heated interactions. Nevertheless, always apply the principle of charity. It benefits you in contentious discussion to always assume the other party is acting in a positive way. Interpret meanings warmly and with an eye towards resolution. The moment you start thinking about how to ‘defeat' or ‘get rid of' the person behind a negative review you lose. It is impossible to fix a problem you don't want to fix. These mindsets keep your interactions focused and show up in the tone of responses. A wall of words may look official and protect the company in theory, but in practice, it comes across as dismissive. Be concise with language and stay on topic. This both avoids running down pointless rabbit holes and keeps you looking reasonable. A common error is to over explain a solution or a policy. It is easier to reference these as a link. This gives you authority and thoroughness while keeping the discussion neat. The most important way to avoid needing to know how to respond to negative reviews is to not get them. Having the tools to respond to customers before they leave reviews is key. Take a look at our free tools and resources to keep your business ahead of the information curve.